Pentagon leadership has set an aggressive timeline to improve the health of the Navy’s strike fighter force, according to a new directive from Secretary of Defense Jim Mattis obtained by USNI News. The Navy’s fleet of F/A-18 Hornets and Super Hornets will have to meet a minimum 80-percent mission capable rate by the end of Fiscal Year 2019, according to a Sept. 17 memo sent from Mattis to military service secretaries and other Defense Department civilian leaders. “Our department faces budget constraints and shortfalls in aviation squadrons across the force. As a result, our aviation inventory and supporting infrastructure suffer from systemic underperformance, overcapitalization and unrealized capability,” read the memo. Defense News broke news of the memo on Tuesday. The Navy defines an aircraft as mission capable, or partially mission capable, as an aircraft that is safely flyable and can perform at least one but not all of its missions, according to a 2017 Naval Air Forces memo. Due in large part to the stress on the Hornet fleet in support of ground operations in Afghanistan and Iraq, the mission capable rate of the Navy’s strike fighter inventory has been on the decline since 2012. In 2012, the rates for the legacy F-18C Hornets was about 55 percent of the inventory, while the rate for the E and F Super Hornets was at 56 and 55 percent respectively, according to Navy aviation readiness data obtained by USNI News. 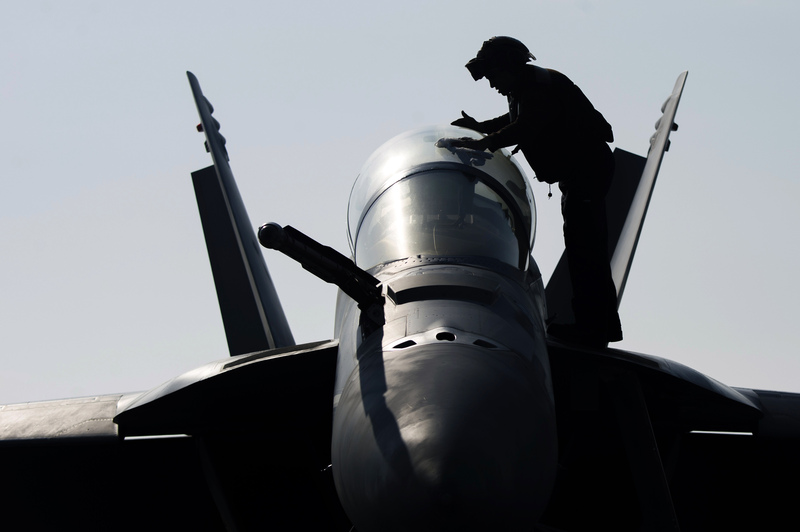 That number has fallen to 44 percent readiness for the Hornets and 49 and 46 percent for the E and F Super Hornets as of early September, according to Navy aviation readiness data. The latest combined Super Hornet readiness number was at 53.3 percent, Naval Air Forces spokesman Cmdr. Ron Flanders told USNI News on Tuesday. The Navy’s operational force is now all Super Hornets, with the legacy Hornets relegated to reserve squadrons. Prior to Mattis’s memo, Chief of Naval Operations Adm. John Richardson had set a goal of a 75-percent mission capable rate for Navy aircraft, or about 341 Super Hornets. That goal was not bounded by a time frame, USNI News understands. An official at the Program Executive Officer Tactical Aircraft Programs (PEO(T)) acknowledged to USNI News on Tuesday the service had received the new targets and was working to figure out how to execute the goal. In August, Secretary of the Navy Richard V. Spencer praised the progress on a backlog of Hornet and Super Hornet depot maintenance that had been previously stalled. “We added 29 fully mission capable Super Hornets since Jan. 1 of 2018, bringing the fleet to 270 up from 241,” he told reporters on Aug. 7. The responsibility for aviation readiness is now directly in the hands of the commander of Naval Air Forces Vice Adm. DeWolfe Miller, Spencer said at the time. Last week, Miller said his command was focused on the new Pentagon strategy of moving forces beyond the low-intensity ground conflicts that defined the last 18 years of war. “We’re [now] all about great power competition and fighting at the high-end,” he said at the Maritime Security Dialogue, sponsored by the U.S. Naval Institute and the Center for Strategic and International Studies. To that end, Miller said readiness assessments moving forward will be geared to a focus on that high-end mission. “I either have an airplane that’s ready to fight or not,” he said. A request for additional information on how the Navy will meet the goal was acknowledged by a Naval Air Forces spokesman on late Tuesday but not immediately responded to.